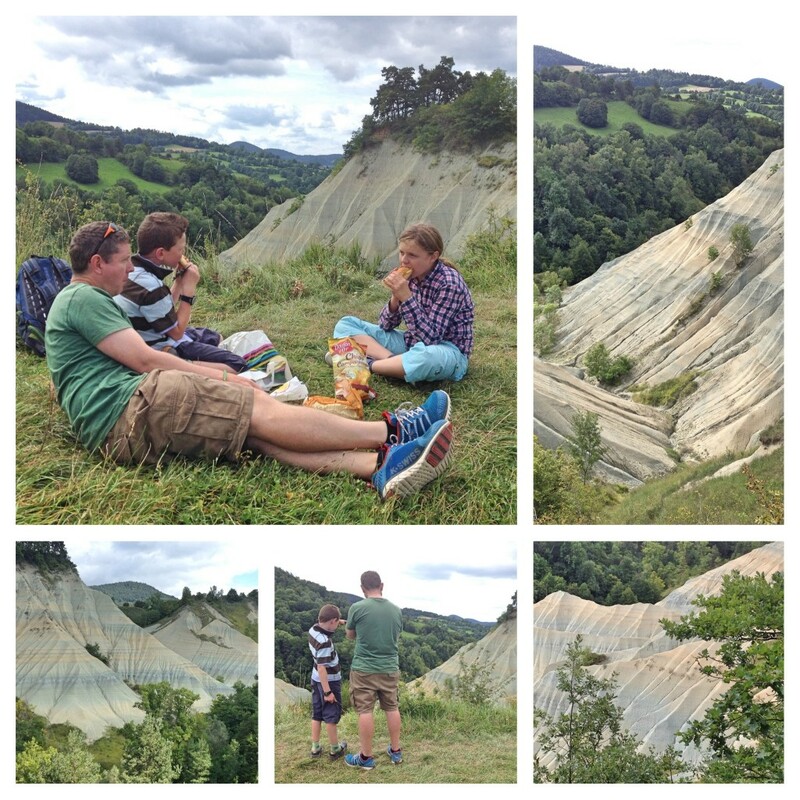 Our summer holiday was spent camping in the Haute-Loire region of central France (read our CosyCamp review). Named after the river that flows through it, the area is predominately rural with lots of small farms, meadows, cattle and forests. 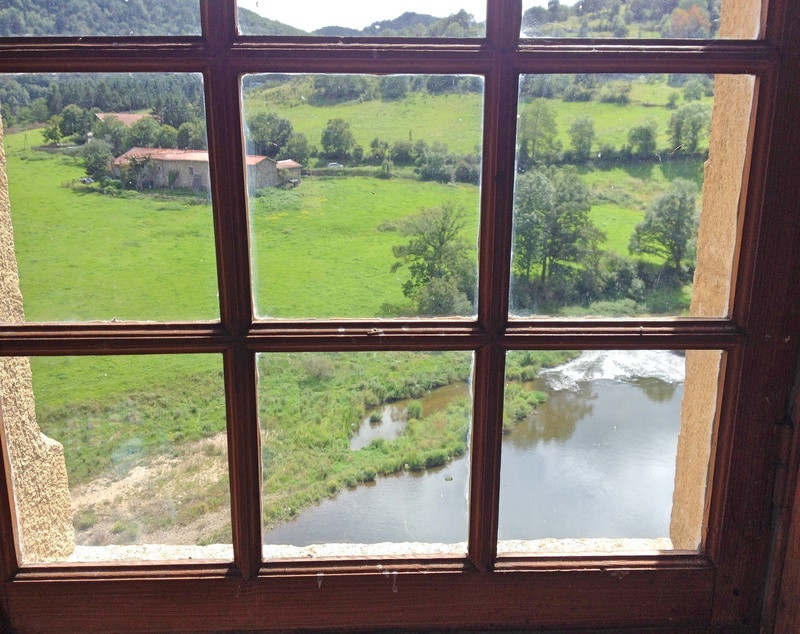 Le Puy-en-Velay is the biggest town (population 20,000) and warrants a separate blog post as there’s lots to see. 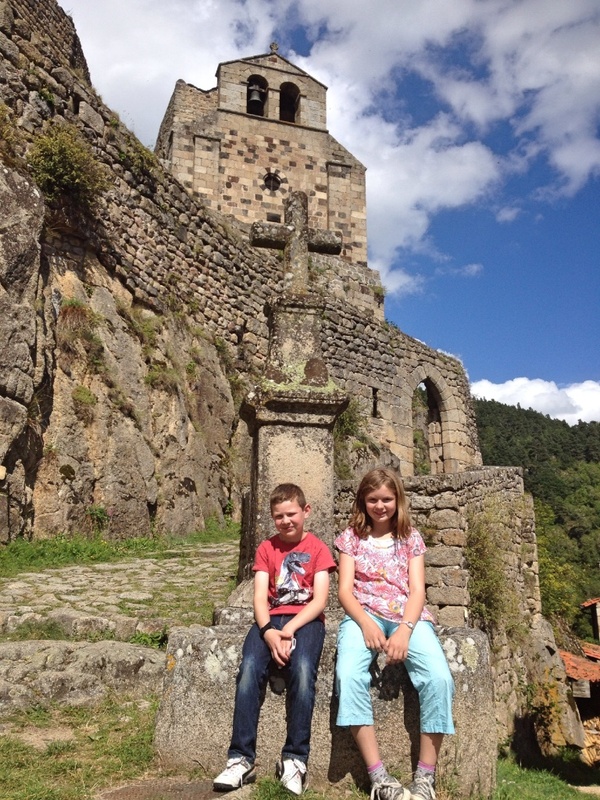 Aside from Le Puy, tourism is low key and it was hard to obtain tourist information in advance of our visit. Even TripAdvisor was woefully short on suggestions. However once there we found plenty to do, and this post will hopefully help future visitors. This small village is situated alongside the River Loire, and was our base for the week. 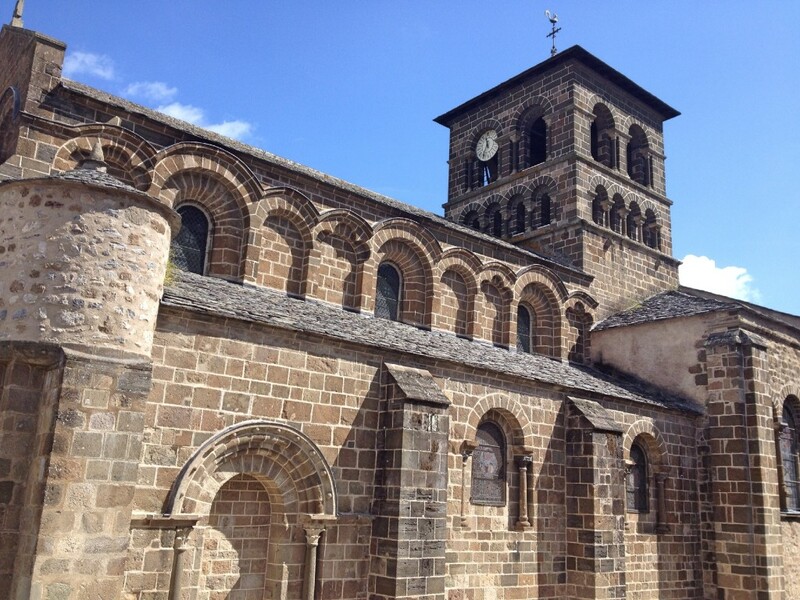 It’s best known for its 12th century Romanesque church which is worth a visit, even if churches are not normally your thing. The village has two restaurants, a bakery and a tourist office which gives out free route maps of local walks. There are a couple of signposted walks from the village. We took the shorter route which led up into the hills behind for some great views. The route is way marked with yellow stripes but we managed to miss some so keep a careful eye on the map. We saw a fair number of people canoeing along the Loire although I’m a non-swimmer so this didn’t appeal. The river looked peaceful and calm during our visit but do take a look at the flood height markings down by the bridge; it’s hard to believe how high the river has reached when you visit during the summer! 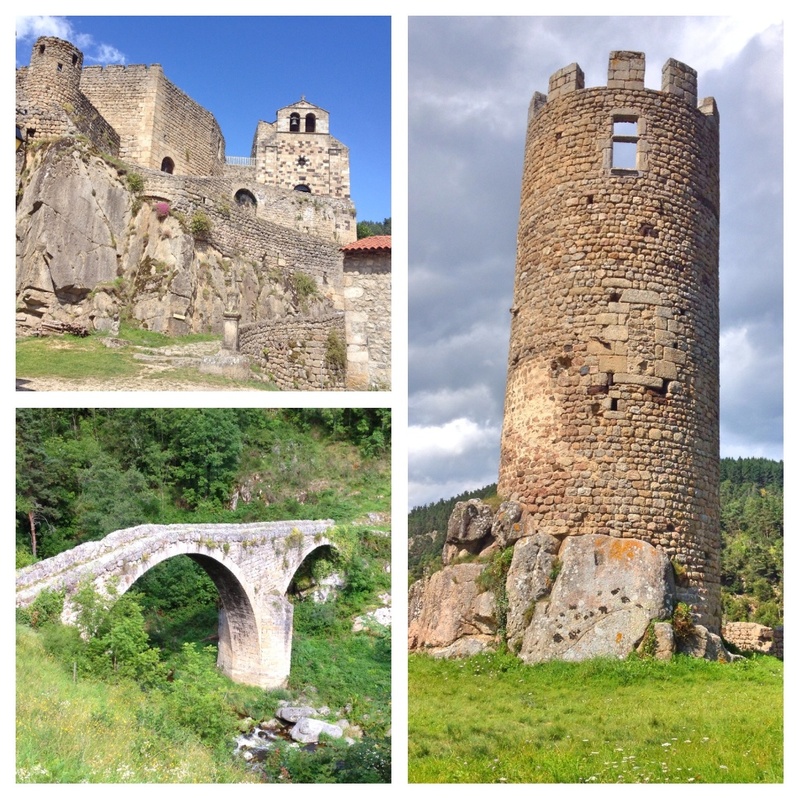 I love castles so our visit to Chalencon Castle and its medieval village was one of my holiday highlights. The parking area is on the outskirts of the village, about 10 minutes away, although longer on the way back when you’re walking uphill. We looked round the 11th century chapel first, although my son was more interested in photographing the lizards running up and down the outside walls. The castle itself was abandoned around 1600, and much of it is now in ruins. You can still look round the battlements, peep up inside the tower and generally imagine what life must have been like for the Lord of Chalencon. If you take the cobbled pathway down from the castle to the Ance river you’ll come to Devil’s Bridge. This is an arch bridge, probably around 600 years old, with a story attached to its name. The legend goes that the devil made a pact with the locals to help save Chalencon from flooding, where he would take the first soul to walk over the bridge. He hoped it would be the local lord, but it turned out to be a dog, much to his disgust! 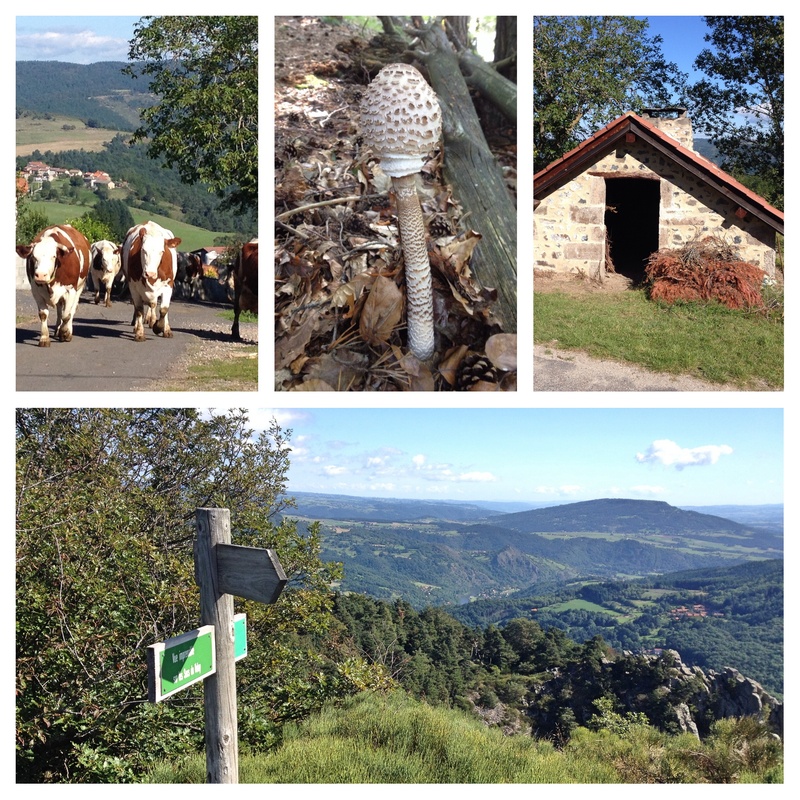 Mont Mezenc lies on the border of the Ardeche and Haute-Loire; it’s distinctive shape is visible from miles around. Whilst you can walk to the summit direct from the nearby village of Les Estables we drove some of the way up and parked on the outskirts of the forest. 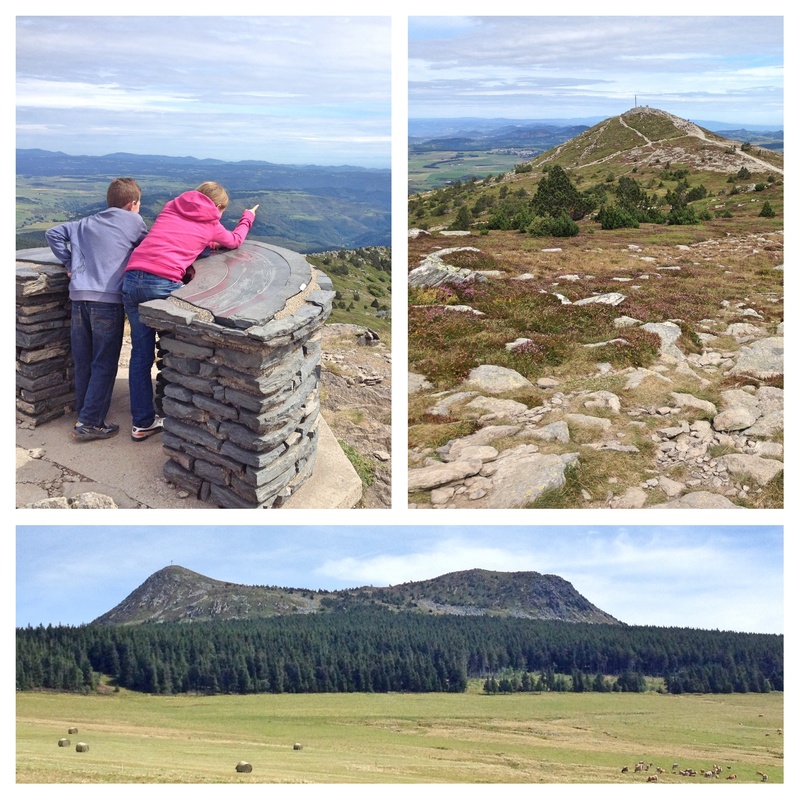 It’s a relatively easy walk up Mont Mezenc from the car park, first through woodland and then across the stony plateau. We didn’t have a map but the path was straightforward and there were signposts on route. The mountain has two summits, with the southern one slightly higher at 1753m. There are two orientation tables and it’s interesting to look at how the scenery differs on either side of the mountain. On one side you can see the Alps, and we may have seen Mt Blanc although I’m not convinced. The village of Les Estables is the highest in the Massif Central and is worth a stop on the way back. It’s a ski centre during the winter months, and even in summer we passed some brave roller skiers on the surrounding roads. This chateau is spectacularly situated on a bend in the River Loire. I had no idea what to expect as I’d only seen it marked on the tourist map but it looked pretty impressive from the outside. Entrance was via guided tour only (in French) although we were given some notes in English. The tour took us through six rooms in which the guide gave a talk about most of the objects in the room, along with a detailed history of the Polignac family portraits. There were several kids in the group but the tour was not aimed at families in any way, ours were bored and fidgety by the end. Suffice to say we wouldn’t rush back but others might enjoy it much more. The Ravin de Corbœuf is formed from multi-coloured clays and is nicknamed ‘Little Colorado’. 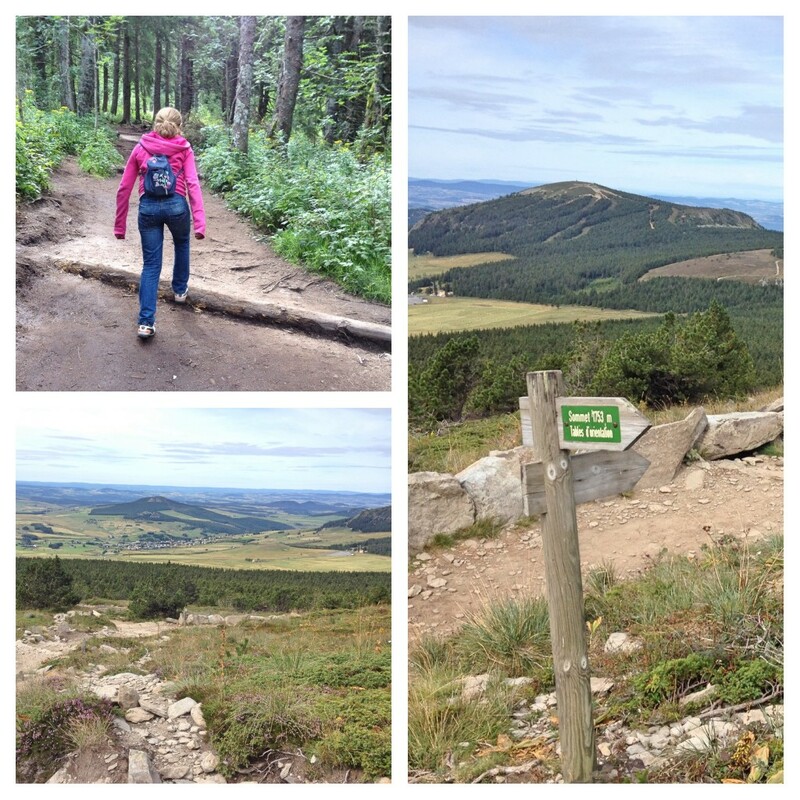 Prior to our visit I’d copied a walk from a French hiking book which turned out to be useful. 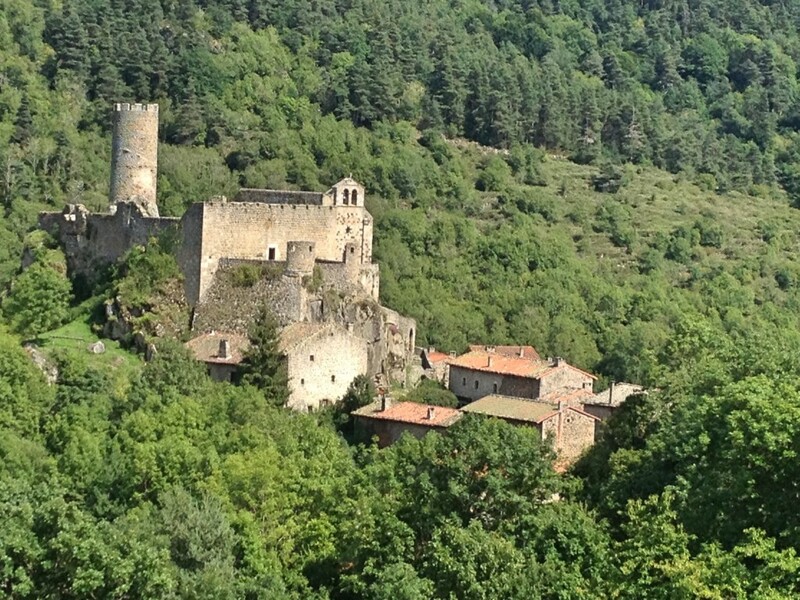 It started in the nearby village of Rosières and took in both ends of the ravine. You could probably figure out the walk without the book as long as you’ve got a better sense of direction than me. The colours in the strata are impressive but the thing I was most amazed at was the total lack of other visitors. This would be a major tourist draw in other areas! Situated opposite our campsite, but separated by the River Loire, the ruins of Chateau Artias tower over the valley. If you happen to be staying at the campsite at Chamaliéres-sur-Loire you can use their kayaks to cross the river, otherwise you’ll need to access it by road from Retournac. The ruins are fenced off but you can walk around the edge to view them. They include a 12th century chapel which was the official parish church for many years. From the top you can look down and along the River Loire, but we didn’t stay long as the rain arrived. 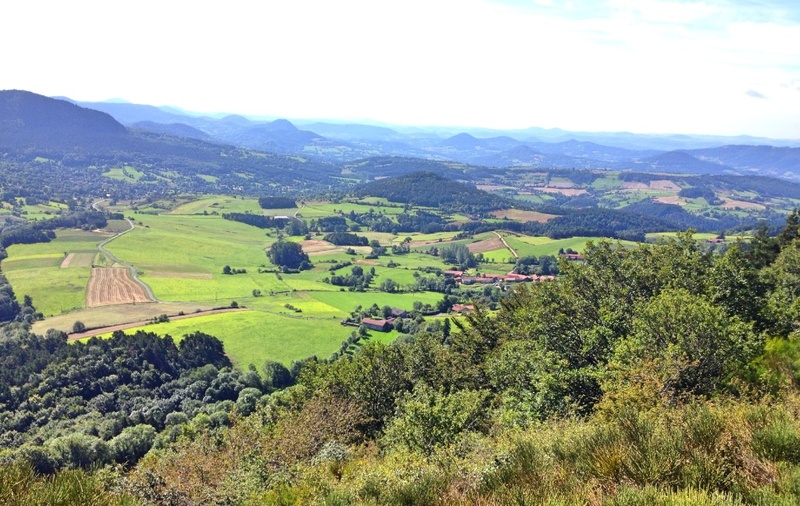 The rolling farmland of the Haute-Loire is punctuated by small volcanic hills, known as ‘suc’. These offer plenty of walking opportunities, and you can be sure of a good view regardless of which one you climb. We booked on a nature walk through our campsite. Adrien, our guide, took us to the top of Suc de Bartou, walking through hamlets and along woodland paths. He pointed out items we’d never have known, for example the building in the top right of the collage is the communal village oven. It took us a couple of hours to reach the summit of Suc de Bartou. It wasn’t difficult walking but the last section was quite overgrown and I’d have never worked out it was the way without a guide. We rested up top for a while, picking out the other volcanic hills in the landscape and watching a peregrine falcon swoop below us. An almost perfect view! This was great fun. As shown in the picture below, you pedal a cart along an old railway track; each cart seats two pedallers and two or three children. After a safety briefing (there are no helmets or seatbelts but you have brakes and lighting) you set off along the track for 4 km. The first part is slightly downhill so you get a brief taste of your return journey but the rest of the outward trip is on a slight incline. The pedalling isn’t too hard, but I think my other half may have been doing more work than me. At the appropriate stopping point you dismount, turn around your cart and freewheel almost the whole way back to the station. This includes a rather scary stretch through a long dark tunnel and across a couple of viaducts but it’s an exhilarating ride and we all loved it. The entire journey takes about 1 hour 15 mins. If you want to take photos, make sure you do this on the way out as you’ll be going too fast on the return journey! The incredible blue colour of this lake is caused by a type of volcanic rock called phonolite. The lake is very photogenic although rather small so I would only suggest a visit if you’re already in the area. Picnics and bathing are not allowed, but you can spend a fun few minutes spotting the fish. At the entrance to Lac Bleu you’ll also find a miniature village with castles and scenes from the Auvergne. We didn’t go in as it looked more suited to families with young children. 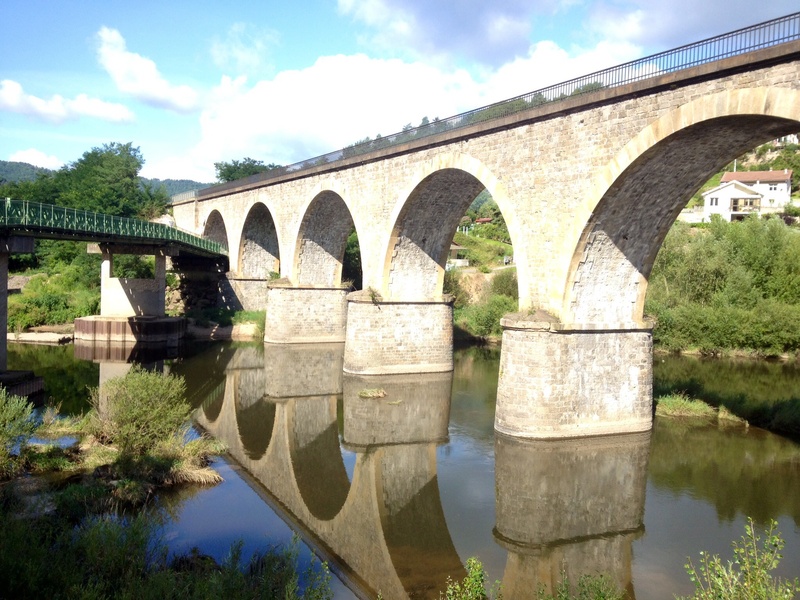 I hope you’ve enjoyed reading this round-up of places to visit in the Haute-Loire, and that you’ve got some inspiration for your holiday. If you have any further suggestions please do leave a comment. 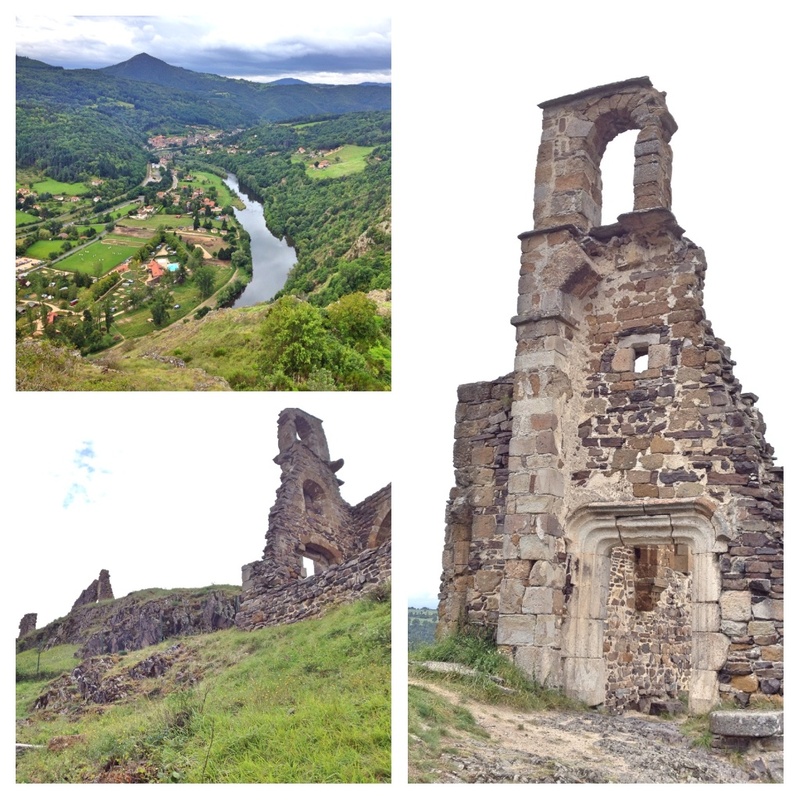 The best site to plan your Haute-Loire travels is here; it’s a pity I didn’t find this until after we’d returned home! During August Chalencon Castle was open from 2.30-6.30pm at the weekend, and 3-6pm during the week. Adults cost 3 euros, children 1 euro. Pay in the chapel and then wait for the attendant to unlock the castle. Chateau de Lavoûte-Polignac is open from April to October, generally from 2-6 pm although longer during July and August. The Velorail costs 12 euros for adults and 5 euros for 5-12 year olds. Children under 5 are free but I’m not sure I’d recommend it for this age group as there are no restraints on the cart. The Velorail operates at fixed departure times, book in advance before you visit. Further details can be found here. Chateau Artias, Ravin de Corbœuf and Lac Bleu are free and open year round. This looks like my kind of holiday. 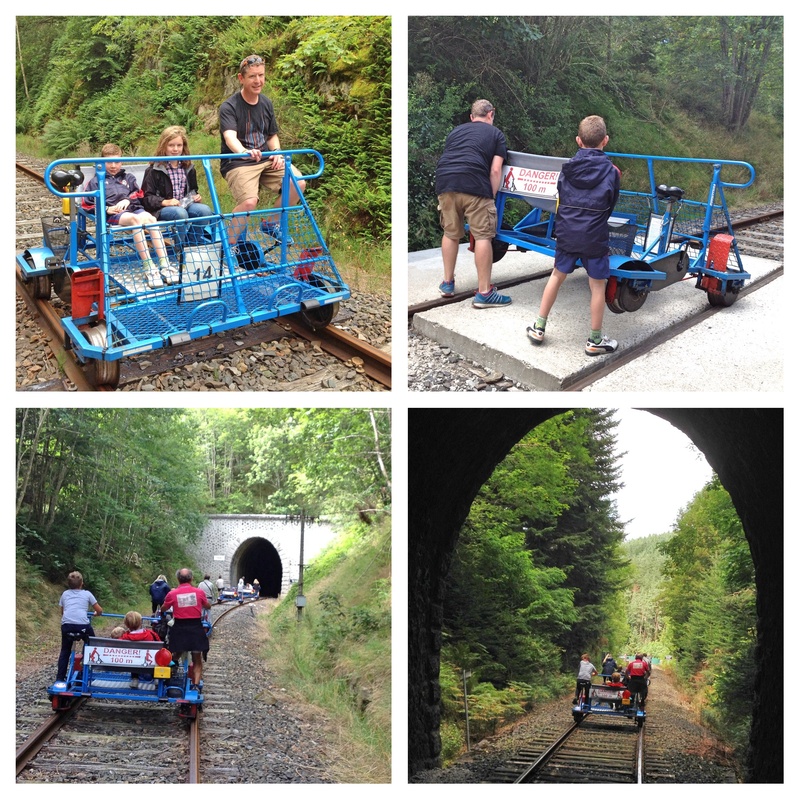 Plenty to explore, lots of wandering and the pedalling along an old railway looks like an awesome activity. Great fun Debra, I like an active holiday. Thanks Catriona. As always I took way too many photos! Looks such a fabulous place, and there is so much to do! Thank you. I’m very glad we chose the area for our holiday although I was a little worried we wouldn’t find enough to do. Wow, what a beautiful place, stunning scenery. The cart looks like fun and I would love to take my kids to see some castles. It sounds like you all had a lovely time. Thanks Karen. The velorail was great fun, I think they need to open one in the UK. It looks like a beautiful place, and it sounds like you had a great holiday too. Thanks Lucy, it was, we really enjoyed it. Thanks Merlinda. Always next year to look forward to! Thanks Fiona. I keep on thinking about that railway cart trip, it was great. What a beautiful place to go on holiday and sounds like you had a great time. 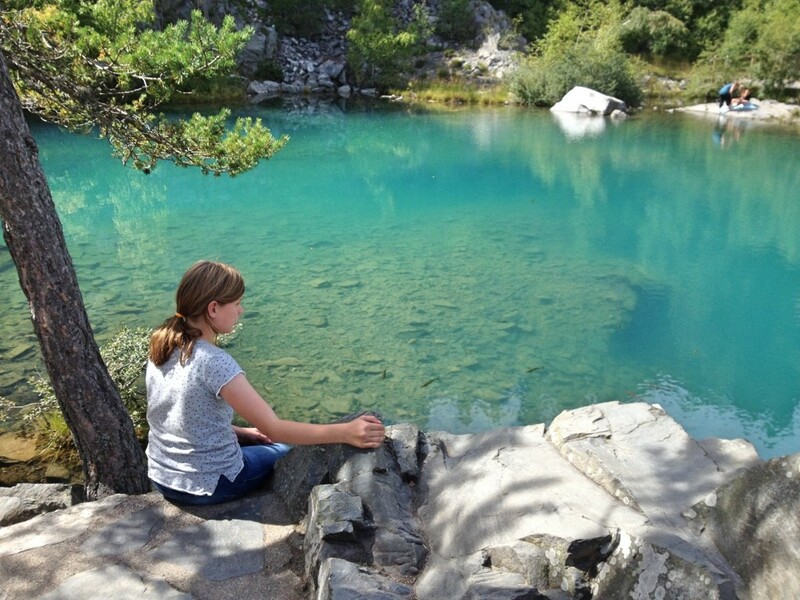 I love your photos – especially the one of Lac Bleu – so pretty. Thanks Louise. Yes, Lac Bleu was pretty and it really was as blue as it looks in the photo. What lovely photographs – looks like you had a wonderful holiday! Thank you Shannon, we did. Seems a long time ago now though…. Thank you. I forgot just how big and varied France is when we were planning this trip; it was good to go somewhere off the tourist route. Thanks Vicky. Yes, I hope you get to visit, just a quick hop over the channel! Thanks Louisa. The castle at Chalencon is certainly like something out of a fairy tale. Thank you. There were good walks, although we could have done with buying a walking map before we went. Thanks Hannah. Sounds like you have great memories, exactly what holidays are for.